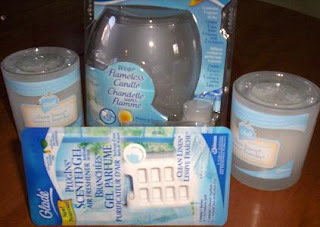 This is Frugal Freebies 3rd weekly giveaway and today we are giving away Glade products. Other companies are welcome to provide products for giveaways, just let me know! ☼ One The Wisp® Flameless Candle - The new Glade Wisp® Flameless Candle combines the warm, flickering glow of a candle with the continuous freshening of an air freshener. Glade Wisp® Flameless Candle is battery operated and portable, allowing you to take it into virtually any room in the house! And with its warm glow and decorative glass jar, you'd never know it wasn't a real candle! ☼ One Glade Plugins® Scented Gel - Turns your wall outlet into a source of fragrance and freshness for 30 days! Each unit gently warms a scented cartridge. ☼ Two Glade Candles - Infuse your home with light, warmth, and the unique blend of two fragrances that complement each other - there's nothing quite like it! Glade® Scented Candles have a way of boosting your spirits and putting your mind at ease. To enter to win one of these great Glade Scented products, simply follow these simple steps and leave a separate comment for each step completed. I will choose one random comment using the Random.org integer generator, so the more comments you leave, the more chances you have to win these great products! Only relevant comments will be accepted. Your Giveaway prize is always free, there is no entry fee, no shipping & handling fee. Two weeks from posting. This giveaway ends on February 9/09. I will e-mail the winner, and results are always posted here as well. If the winner doesn't respond within four business days, with contact details, a new winner will be drawn. Thank you to the Bloggy Giveaways for listing my giveaway! Glade makes my home smell wonderful! Please count me in! ~ :) THanks! I would love to win so I can make my home smell pretty. I love the Glade products and would really love to try them for free! I have been wanting to try glade's products, but haven't yet - I would love to win! Thanks again for the chances. I love Glade products-they make my home smell refreshing! Want to win because it is time to freshen my home and I love Glade products. Clean Linen scent is my favorite.